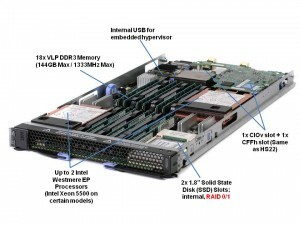 IBM officially announced today a new addition to their blade server line – the HS22v. Modeled after the HS22 blade server, the HS22v is touted by IBM as a “high density, high performance blade optimized for virtualization.” So what makes it so great for virtualization? Let’s take a look. One of the big differences between the HS22v and the HS22 is more memory slots. The HS22v comes with 18 x very low profile (VLP) DDR3 memory DIMMs for a maximum of 144GB RAM. This is a key attribute for a server running virtualization since everyone knows that VM’s love memory. It is important to note, though, the memory will only run at 800Mhz when all 18 slots are used. In comparison, if you only had 6 memory DIMMs installed (3 per processor) then the memory would run at 1333Mhz and 12 DIMMs installed (6 per processor) runs at 1066Mhz. As a final note on the memory, this server will be able to use both 1.5v and 1.35v memory. The 1.35v will be newer memory that is introduced as the Intel Westmere EP processor becomes available. The big deal about this is that lower voltage memory = lower overall power requirements. The second big difference is the HS22v does not use hot-swap drives like the HS22 does. Instead, it uses a 2 x solid state drives (SSD) for local storage. These drives have hardware RAID 0/1 capabilities standard. Although the picture to the right shows a 64GB SSD drive, my understanding is that only 50GB drives will be available as they start to become readlily available on March 19, with larger sizes (64GB and 128GB) becoming available in the near future. Another thing to note is that the image shows a single SSD drive, however the 2nd drive is located directly beneath. As mentioned above, these drives do have the ability to be set up in a RAID 0 or 1 as needed. Reason #1 : in order to get the space to add the extra memory slots, a change had to be made in the design. IBM decided that solid state drives were the best fit. Reason #2: the SSD design allows the server to run with lower power. It’s well known that SSD drives run at a much lower power draw than physical spinning disks, so using SSD’s will help the HS22v be a more power efficient blade server than the HS22. Reason #3: a common trend of virtualization hosts, especially VMware ESXi, is to run on integrated USB devices. By using an integrated USB key for your virtualization software, you can eliminate the need for spinning disks, or even SSD’s therefore reducing your overall cost of the server. b) simple – IBM wants to get this product into the marketplace sooner than later. 1) Will it fit into the BladeCenter E? YES – however there may be certain limitations, so I’d recommend you reference the IBM BladeCenter Interoperability Guide for details. 2) Is it certified to run VMware ESX 4? 3) Why didn’t IBM call it HS22XM? According to IBM, the “XM” name is feature focused while “V” is workload focused – a marketing strategy we’ll probably see more of from IBM in the future. That’s it for now. If there are any questions you have about the HS22v, let me know in the comments and I’ll try to get some answers. For more on the IBM HS22v, check out IBM’s web site here. Check back with me in a few weeks when I’m able to give some more info on what’s coming from IBM! Cisco’s UCS server line is already getting lots of press, but one of the biggest interests is their upcoming Cisco UCS B250 M1 Blade Server. This server is a full-width server occupying two of the 8 server slots available in a single Cisco UCS 5108 blade chassis. The server can hold up to 2 x Intel Xeon 5500 Series processors, 2 x dual-port mezzanine cards, but the magic is in the memory – it has 48 memory slots. This means it can hold 384GB of RAM using 8GB DIMMS. This is huge for the virtualization marketplace, as everyone knows that virtual machines LOVE memory. No other vendor in the marketplace is able to provide a blade server (or any 2 socket Intel Xeon 5500 server for that matter) that can achieve 384GB of RAM. So what’s Cisco’s secret? 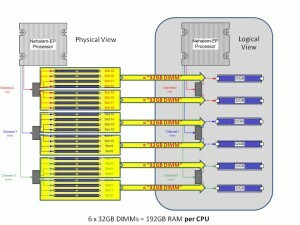 First, let’s look at what Intel’s Xeon 5500 architecture looks like. As you can see above, each Intel Xeon 5500 CPU has its own memory controller, which in turn has 3 memory channels. Intel’s design limitation is 3 memory DIMMs (DDR3 RDIMM) per channel, so the most a traditional server can have is 18 memory slots or 144GB RAM with 8GB DDR3 RDIMM. 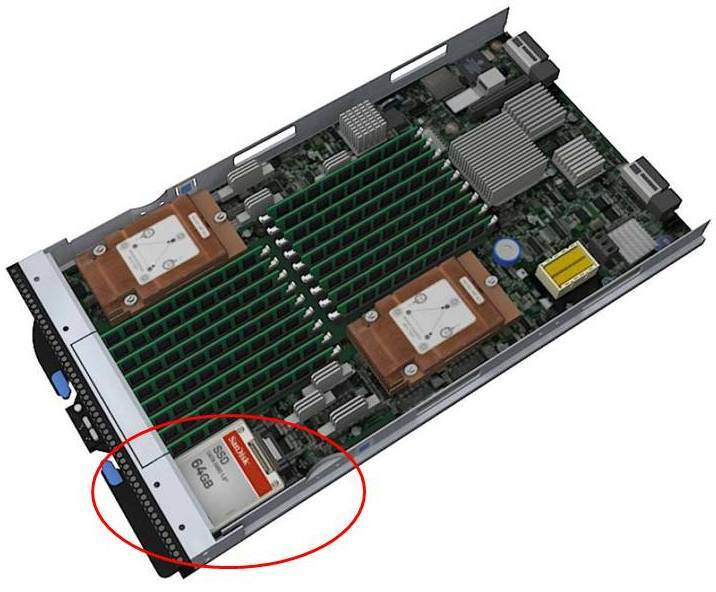 With the UCS B-250 M1 blade server, Cisco adds an additional 15 memory slots per CPU, or 30 slots per server for a total of 48 memory slots which leads to 384GB RAM with 8GB DDR3 RDIMM. With that many slots, you can get to 192GB of RAM using 4GB DDR3 RDIMMs– which currently cost about 1/5th of the 8GB DIMMs. That’s the real value in this server. Cisco has published a white paper on this patented technology at http://www.cisco.com/en/US/prod/collateral/ps10265/ps10280/ps10300/white_paper_c11-525300.html so if you want to get more details, I encourage you to check it out. For those of you not familiar with the BL2x220 Blade Server, I think it is one of HP’s best kept secret. This blade server is an awesome feet of design because it is not just 1 server, it is 2 servers in 1 blade case – in a clam shell design (see below). 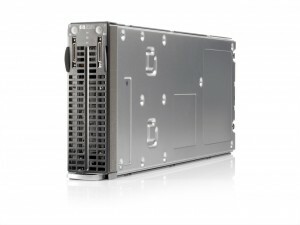 This means that in a HP C7000 BladeSystem chassis you could have 32 servers! That’s 64 CPUs, 256 CORES, 3TB of RAM all in a 10U rack space. That’s pretty impressive. The HS22 achieved these results using two Quad-Core Intel Xeon Processor X5570 (2.93GHz with 256KB L2 cache per core and 8MB L3 cache per processor—2 processors/8 cores/8 threads). The HS22 was also configured with 96GB of memory, the Red Hat Enterprise Linux® 5.4 operating system, IBM J9 Java® Virtual Machine, 64-bit Accoria Rock Web Server 1.4.9 (x86_64) HTTPS software, and Accoria Rock JSP/Servlet Container 1.3.2 (x86_64).